Die Hard Biggie fans can wear their love around their necks. The folks who brought you the wooden Jesus piece at GoodWoodNYC have created a chain to honor the notorious one. 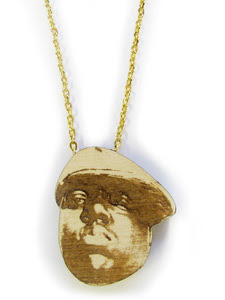 The Wooden Biggie piece is a perfect portrait of the rap king in his signature Kangol hat. Rock this and you are sure to turn heads. Plus since it's only $18 it's all good baby baby!